Can I get Symbicort online without a prescription? Symbicort may be prescribed for people who need treatment for asthma online, so long as you have used this medication before and you agree to have an annual assessment. To get your inhaler, please click on the free consultation button. Asthma is an inflammatory disease of the airways and COPD is a lung disease causing obstruction of the airways. Both diseases cause breathing difficulties such as shortness of breath. Symbicort is a combination product containing two medicines (budesonide and formoterol) that work in different ways to help you breathe. Budesonide is a corticosteroid that both prevents and reduces inflammation in the lungs, while formoterol is a bronchodilator (or long-acting beta2 adrenoceptor agonist) that relaxes the muscles in the airways enabling you to breathe more easily. Symbicort is provided in an inhaler (Turbohaler). Your doctor will tell you how many times a day you must use your inhaler. Symbicort must be taken even if you do not have symptoms of asthma or COPD at that time. If you miss a dose, take it as soon as possible but not if you are soon due to take your next dose, and never take a double dose to compensate. Instructions for use are provided with Symbicort inhaler and should be followed carefully. The Symbicort inhaler needs to be prepared before use. This is done by turning the red grip in one direction and then the other while the device is upright. When a 'click' is heard, this action is repeated and the inhaler is ready to use. Firstly, gently breathe out. Then, with the mouthpiece in your mouth (lips closed), breathe in through your mouth as deeply as possible. Finally, after removing the inhaler from your mouth, breathe out gently. After use, put the cover on tightly and rinse your mouth with water. This procedure should be repeated if you have to have more than one dose of medicine. You can see how many of the 60 doses in the inhaler have been used from the dose indicator. If you have asthma you will also be provided with a 'reliever inhaler' for when you experience asthma symptoms, to make it easier to breathe. Symbicort can be used by children aged 6 years and over, adolescents, and adults. It cannot be taken by those with an allergy to its ingredients - budesonide, formoterol and lactulose. Use of Symbicort by pregnant women or by women who plan to become pregnant or breast feed should first be discussed with a doctor. To ensure that it is safe for you to take Symbicort, let your doctor know if you are diabetic or if you have a lung infection, high blood pressure, low blood potassium levels, and any problems with your heart, thyroid, adrenal gland or liver. Also tell your doctor what medicines you are or have recently been taking for these conditions (such as medicines for diabetes, blood pressure, heart disease and thyroid problems). In addition, your doctor will need to know if you are or have been taking steroids, bronchodilators, and medicines to treat asthma, infections, Parkinson's disease, HIV/AIDs, psychoses and depression. Mention if you are going to receive a general anaesthetic for surgery or at the dentist. So long as you make a full disclosure, there will not be an opportunity for an inappropriate prescription. Symbicort may cause throat irritation, coughing, sore throat, headache, palpitations (a fast heartbeat), trembling and thrush. Palpitations are usually mild and disappear over time, while the risk of thrush may be minimised by washing your mouth with water after using Symbicort. Restlessness, disturbed sleep, dizziness, nausea, bruising, and muscle cramps are less common. You should seek medical attention immediately if you experience an allergic reaction (including swelling of the face, mouth and tongue, hives, breathing difficulties, and feeling faint) or an attack of wheezing or shortness of breath straight after using your inhaler. These reactions happen rarely. However, you must immediately stop using your inhaler, use your 'reliever' inhaler, and contact your doctor. A consultation with one of our experienced doctors is available free online should you wish to discuss and treat your asthma. 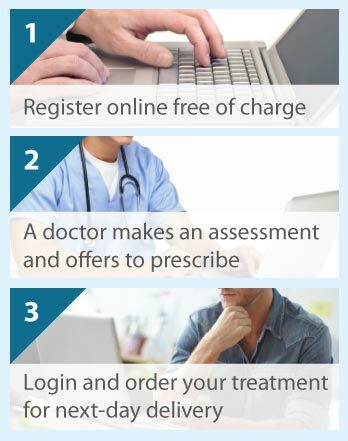 Click on the Free Consultation button and complete the short online questionnaire to get a repeat prescription.